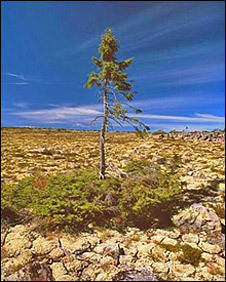 A tree said to be the oldest on the planet - thought to be nearly 10,000 years old - has been found in Sweden. Scientists from Umeaa University discovered the spruce on Fulu Mountain in Dalarna province while carrying out a census of tree species there in 2004. The age of its genetic material was recently calculated using carbon dating at a laboratory in Miami, Florida. Scientists had believed the world's oldest trees were 4,000-year-old pine trees found in North America. The oldest, a bristlecone pine named Methuselah located in California's White Mountains, is aged 4,768, according to the Guinness Book of World Records. The new record contender, which would have taken root just after the last ice age, was found among a cluster of around 20 spruces believed to be more than 8,000 years old at an altitude of 910m (2,985ft) on Fulu Mountain. The visible portion of the spruce was comparatively new, but analysis of four "generations" of remains - cones and wood - found underneath its crown showed its root system had been growing for 9,550 years, Umeaa University said. Umeaa's professor of physical geography, Leif Kullmann, said the spruce's stems or trunks had a lifespan of around 600 years, but as soon as one died, a cloned stem could emerge from the root system. The clones take root each winter as snow pushes low-lying branches of the mother tree down to ground level, Mr Kullmann added. The discovery of the tree has been surprising, because the spruce had until now been regarded as a relative newcomer in the region. "Our results have shown the complete opposite, that the spruce is one of the oldest known trees in the mountain range," Mr Kullmann said. He explained that 10,000 years ago the spruce would have been extremely rare in the region and that it was conceivable Mesolithic humans might have imported the species as they migrated northwards with the receding ice cap. The discovery also shows that it was much warmer in the region at the time than had been thought previously, perhaps even warmer than today, he added.